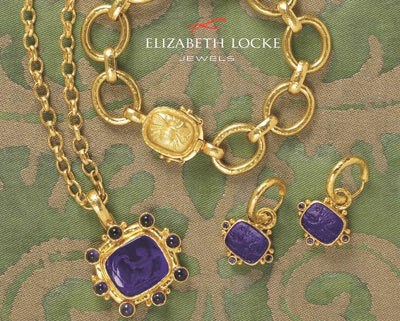 About: Elizabeth Locke draws on a lifelong fascination with the antique jewelry of the Etruscans, Greeks and Romans as she creates her own neo-classical hand-made 19k gold jewelry. She selects every stone and designs every piece herself. While many covet the luminescent stones or the Venetian glass intaglios in her designs, Elizabeth’s deepest passion is for one-of-a-kind antiquities: 19th century micromosaics and pietra duras, 18th century Chinese gambling counters, Essex crystals, miniature paintings or antique Japanese porcelain buttons. © 2018 Sam L. Majors Jewelry. All Rights Reserved.